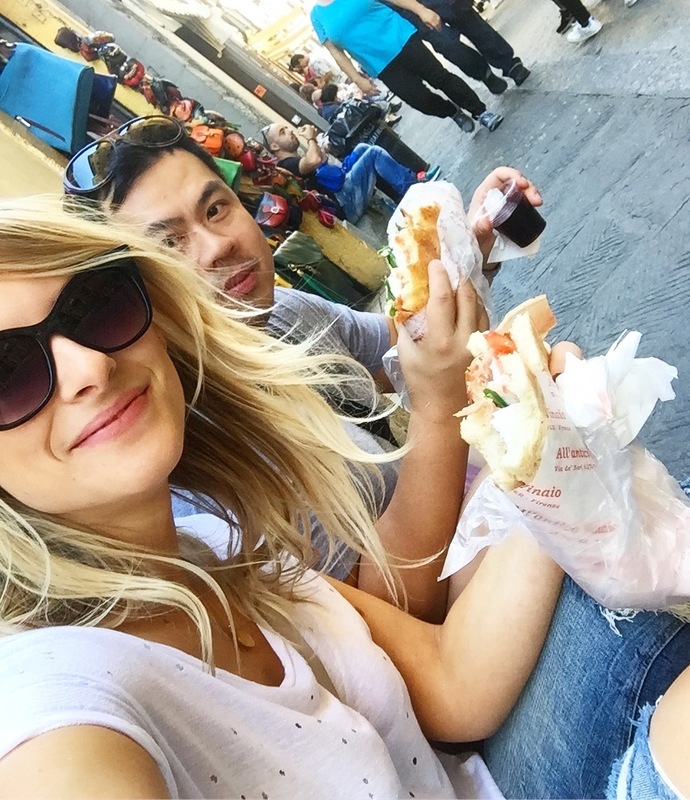 I'm finally wrapping up the last of our trip to Italy. From Bellagio, we took a 45 minute hydrofoil boat ride to the small town of Lake Como. We stayed at a the boutique-style Hotel Metropole Suisse, and the location was perfect as it was directly across the street from the hydrofoil dock--and when you're lugging far too many suitcases, you want to be close. We checked in, dropped our bags and took in the view. We had a gorgeous lake view, and the mountains were just stunning. Such a picturesque spot to stay, and I was excited to get out and explore. Venice was that one city I was on the fence about--it seemed silly not to go there, being in Italy, and not checking it out last time, but I just wasn't... sold. Cue the moment we stepped out of the train station: sold. Something about being surrounded by so much water, the vastness of it and the fact that the city was built on it, was just so incredible. 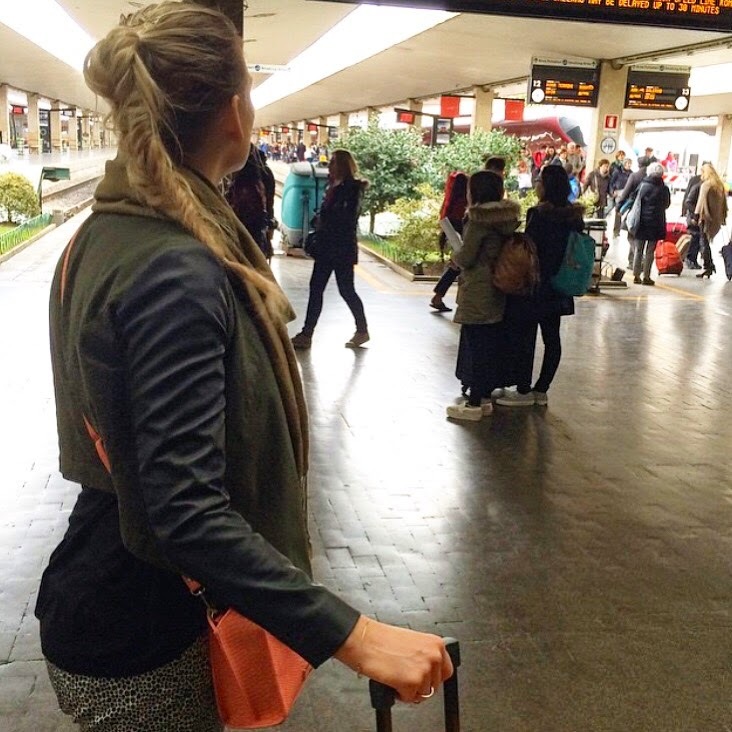 The plan from Pisa was to head out to Cinque Terre, a picturesque town we had never been to. However, since we aren't planners, and were booking our accommodations as we went, we couldn't find anything that looked great. After hours of searching over dinner, and back in our hotel room, Marco asked how I'd feel about going back to Florence for one more night. I was totally down. 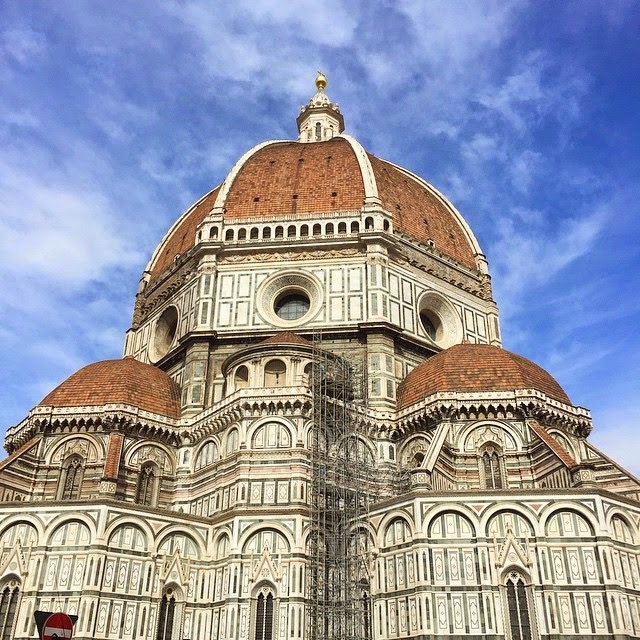 If you couldn't tell, Florence is a favourite for both of us and since we had lost our luggage and spent our only full day there on a wine tour, the thought of getting a little more QT with the city was just what the Doctor ordered. We packed our bags and hoped on (the wrong) train in the morning--which may or may not have been my fault--and eventually made it to the city in the early afternoon. First stop: paninis on the street! 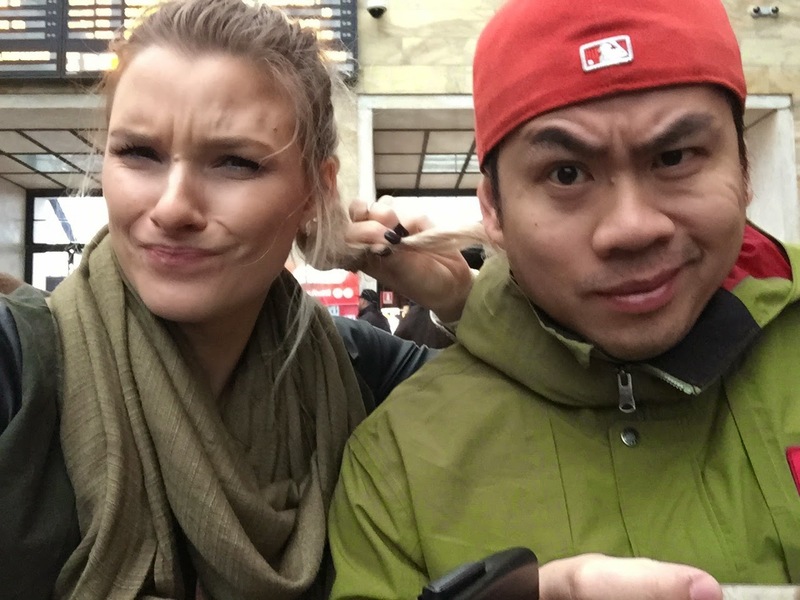 After a couple days in Florence, we took a train to Pisa, which was about 45 minutes away. We had never seen it before, and since it was so close, we decided to do one night. Hi ladies! 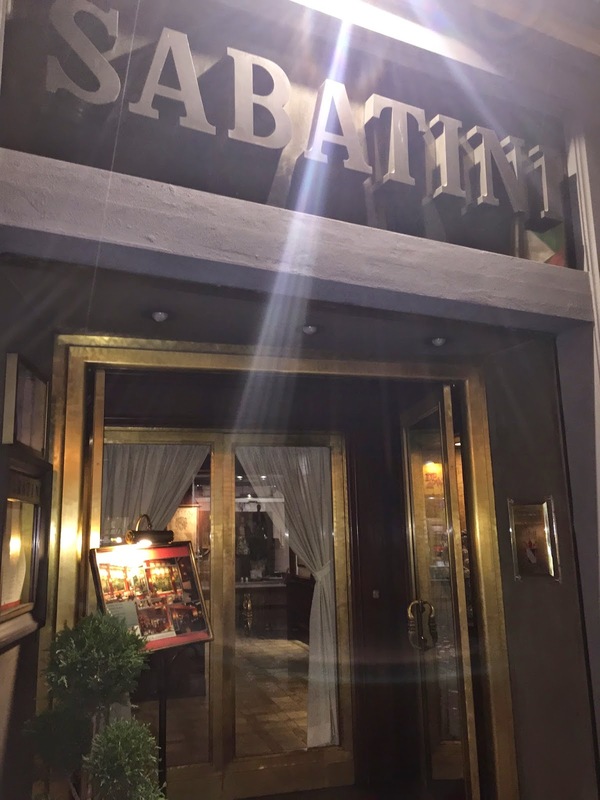 I took to Snapchat last night because I wasn't sure if I should share a huge photo round up of the entire trip to Italy in one post, or break it up into multiple posts per city. I left it to a vote on Snap and multiple posts won by a landslide! So thank you to everyone that voted with their screen shots, and that's what I will do. When we were planning our trip back in August, we had always said if we went back to Europe, we would do Spain or Greece. However, when push came to shove, we kept going back to Italy, how much we loved it last time, and ultimately decided to go back and travel north this time, with the start our trip in our favourite city first. While in Italy, we visited Bellagio, a little town up north, on Lake Como. To say it was an amazing experience doesn't do it justice because the hotel and scenery were so unbelievably beautiful, you'd think it was out of a painting. The day we arrived, it was beautiful, warm and sunny. We took advantage by exploring the property and snapping some photos. I'm so glad we did, because the following day, it rained all day long--however, considering it was the best hotel of our entire trip, not a bad way to hang out indoors (plus their Internet connection was amazing). We arrived in Bellagio yesterday afternoon, travelling from Venice on the train, then by car to this beautiful, small town. 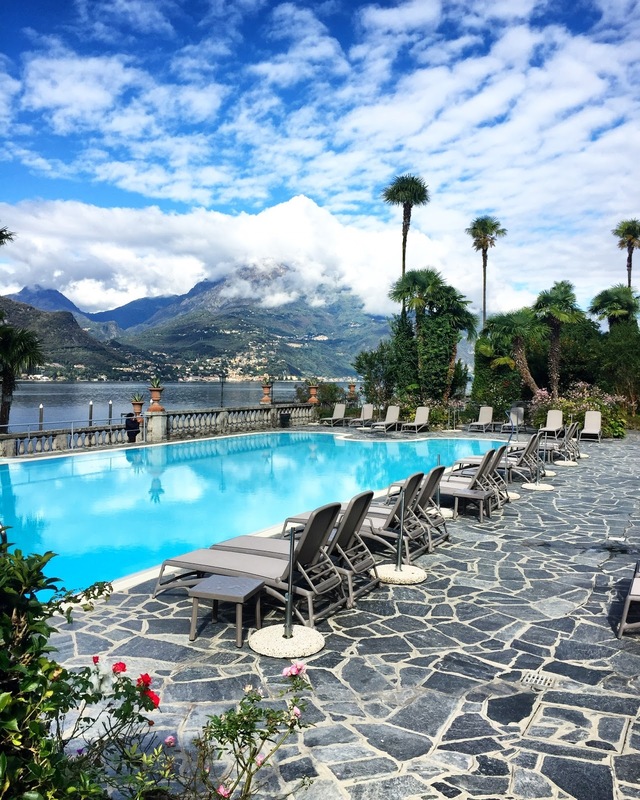 Situated in the province of Como, we were really excited to stay in the main part of the village at Hotel du Lac. Situated directly across from the ferry, steps from amazing food and shops, the location really cannot be beat. We checked into our hotel and headed out to explore the little town. Bellagio is definitely a walk-able town, and you certainly won't need a car here. There are, however, tons of stairs to go up and down, so flat, comfortable shoes are a must. 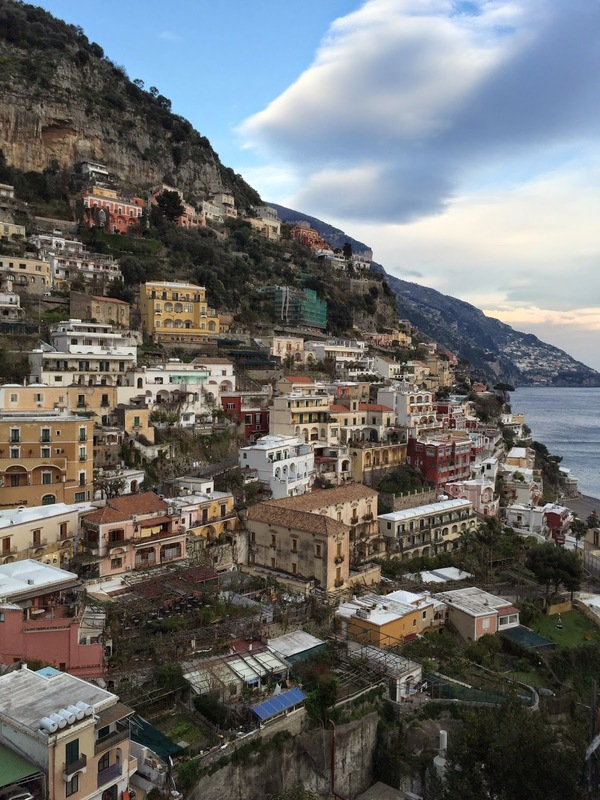 Poke around the boutiques, purchase Como-famous silk scarves or grab a gelato and take in the amazing views. If you are subscribed to my YouTube channel (I put out new videos every week), you have already seen this video. If not, today I'm sharing my Italy haul! These are the items I purchased during our two-week long trip to Italy back in April. It's a mixture of clothing, shoes and the biggest purchase: my first designer bag. I did, however, forget to include these slides (you can see me wearing them here) when I was rounding up all my items--oops! 1. Toilets & Restrooms | Often times restrooms are singles and not gender specific. Additional, toilet seats are next to non-existent, so you're either squatting or sitting on the bowl. I had also heard that sometimes you would need your own paper so always kept tissue travel packs on me, but never had that problem. Also, it feels frowned upon to use a restaurant or store's washroom unless you're buying something there. 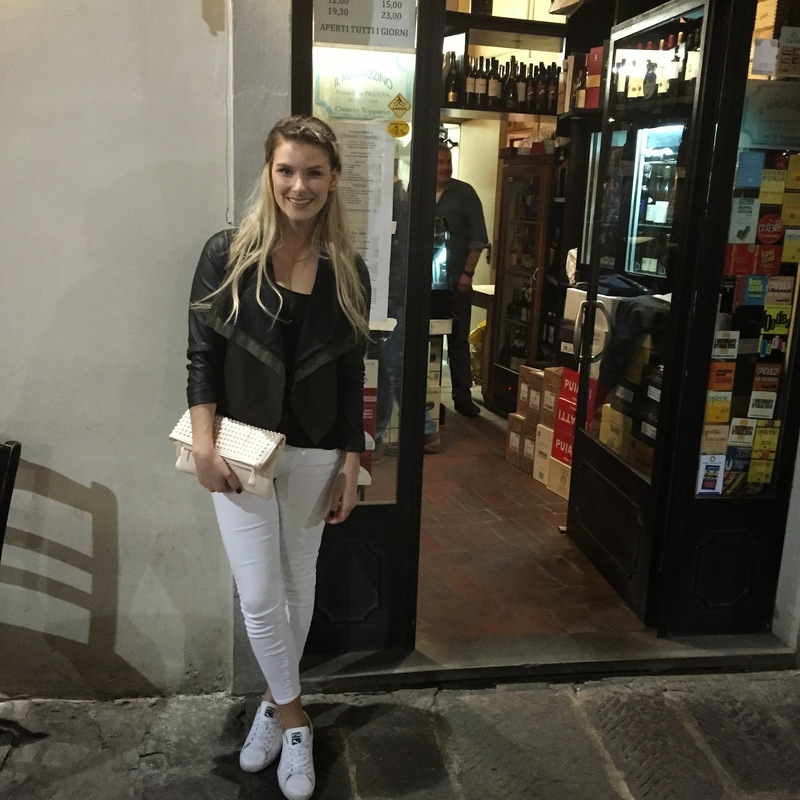 Style and comfort were the two elements necessary for traveling throughout Italy, and these pants I picked up in Rome fit the bill perfectly. I love the slightly dropped-crotch and faux leather details that bring an element of chic to what is technically a glorified pair of sweats. Throw on with some daily jewelry, a bold lip and a pretty top to dress up the look. 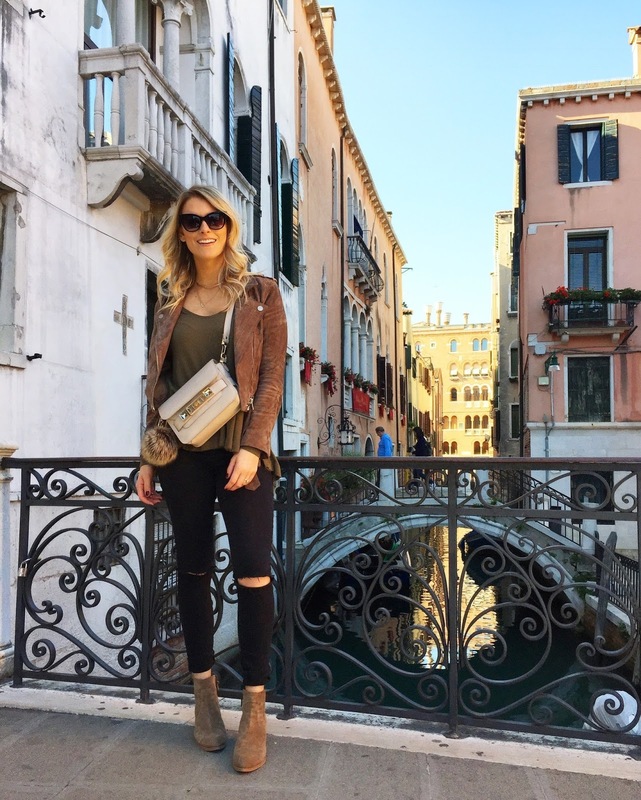 This would work equally well with heels, but that was no option in Italy with the cool temps and cobblestone, so kicks it was! On our way to Rome, from Florence, we sat across from a guy on the train who had been staying in Rome. 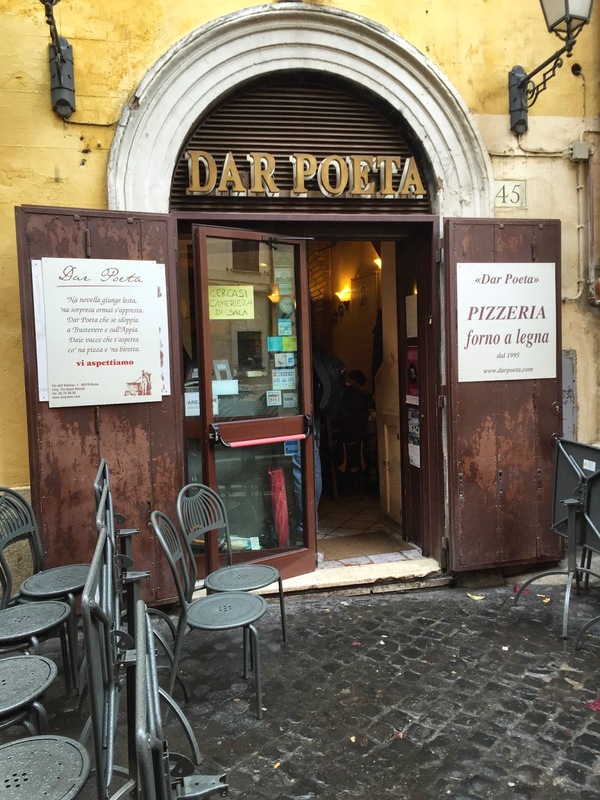 Of course I asked him if he had any recommendations for food and he did: Dar Poeta. On our last full day in Rome, we visited the Colosseum. Marco purchased tickets in advance which saved us from standing in two lines--ahem, we learned our lesson, clearly--and waiting in the freezing winds. Don't let the sunshine fool you, it was quite chilly. Our first day in Rome was freezing and raining but by day two, the sun came out and despite it still being frigid, it was much more pleasant with a bit of heat beaming down on us. For this 12-day trip, packing was definitely an obstacle, more specifically it being my first trip of such length. 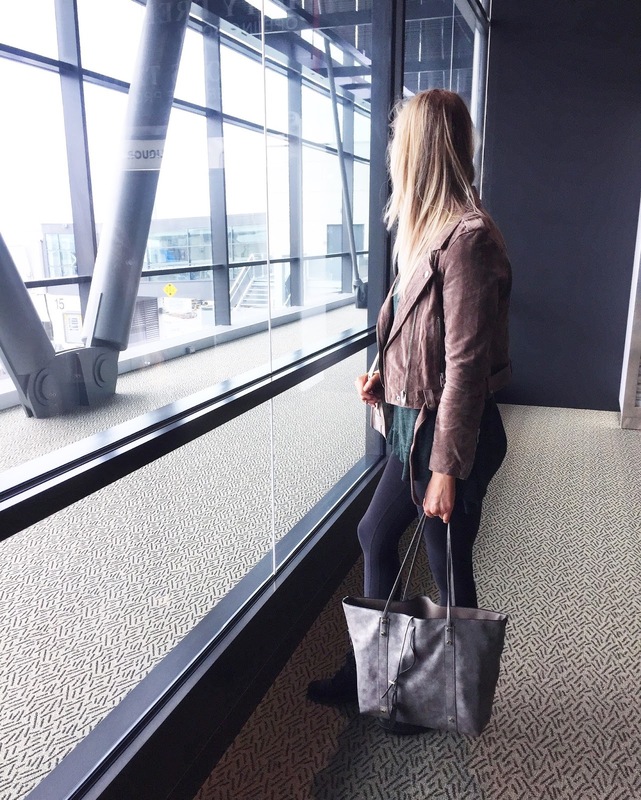 I have been doing my best to mix and match everything I brought, and kept that in mind while packing a mixture of neutrals and a few same-colour pieces to keep it effortless yet somewhat stylish. Rome was really cold and rainy the day before we shot these photos, but fortunately the sun came out the next day. Don't let those rays fool you, it was still quite chilly, under 10 degrees Celsius and I bundled up in my jacket and scarf after! I'm still looking for the perfect Italian leather boot while we are here, which I was hoping to find sooner than later so I could wear them here (and throw these Pumas out because they are done-zo after this trip and multiple days in the rain--yuck!). If not, at least before we come home on Sunday. 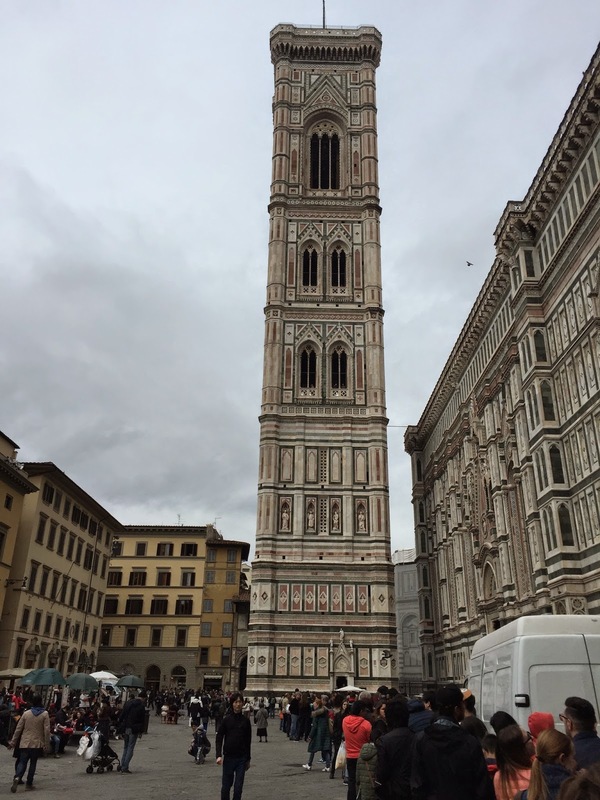 On our third, and final day, in Florence, we stood in line to get tickets and climb the Duomo--a huge cathedral (above) that you can climb over 500 stairs to the top, outside, look out and see the entire city.